Tyffannie is still looking for this dog, and Sybil is looking for this same dog. Hi, I’m looking for a toy my son used to love, and I need to find another one for him. He is so sad. It is made by Blankets and Beyond, and it said Canada on the tag. It was blue and had a yellow belly with colorful polkadots on it. It came with a blanket, but they are not attached. He had his doggy since he was born and always has it with him. Unfortunately he went to my in-law’s house and returned without it. Now his doggy is nowhere to be found, and he cries all the time for it. At night he asks for his Woof Woof, and I feel awful. I just have to find another doggy just like it. The colors are closer to being correct in this photo. Found it on ebay at a reasonable price too. Ebay item # 380057952233 . Good Luck! 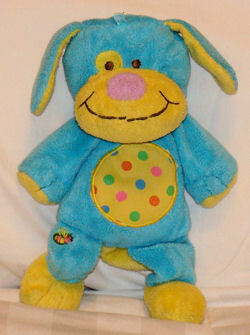 I am still looking for the BLUE DOG with YELLOW BELLY & POLKA DOTS for my grandson (as shown above in the photo that I sent to you). My grandson has never stopped asking about his precious dog and I would love to find one for him. don’t know if it could find you any additional clues or be a substitute while the search continues. Best Wishes.